I got some really good news last week - I was selected to be an Ambassador for St. Louis Fashion Week (#stlfw) this October! I have never been able to attend in the past, so I am extra excited to not only attend, but to be able to witness everything up close and personal! I was checking out the designers, and was really excited to learn more about Tess Giberson and shop some of her pieces. My search turned up this sweater, which I thought was absolutely perfect for the summer. Say what? Sweaters in the summer? Even as the temperatures encroach into the upper 90s, I still love loose knit sweaters like these because inevitably I'm cold indoors wherever we are at - restaurants, movies, at the house, doesn't matter! It's lightweight enough outdoors, but provides enough coverage to keep me comfy inside, too. And the sweater is an accessory to me in and of itself. A simple wrap bracelet and this studded bag was all I needed to complete my look. I felt like one of the girls from Laguna Beach in this outfit. I wish I could be frolicking around on the beach around a fire with my own version of Stephen Colletti. Congrats on becoming a fashion week ambassador too - that's sure to be lots of fun! I love fashion shows, that will be so much fun. Love this light sweater. Eeeshk, little late on these replies, huh? I'm crazy excited about fashion week! It can't get here soon enough! Woo hoo!! Congrats on being a STLFW Ambassador!!! And I love your Laguna Beach analogy of your outfit here. Ha ha! Thanks for all your support! I'm really excited - it will be here before I know it!! Eeee!! Congrats on being a fashion week ambassador! Your sweater looks so lightweight and airy - perfect for summer! Thanks for the note! I'm really thrilled and excited - cannot wait to recap everything for you guys! It's really a great sweater! I'm always always cold inside! Glad you can relate! And thank you! Oh you know it! I'm sure between IG and my blog you will feel like you're part of the action!! :) I am ridiculously excited!! What wonderful and exciting news! 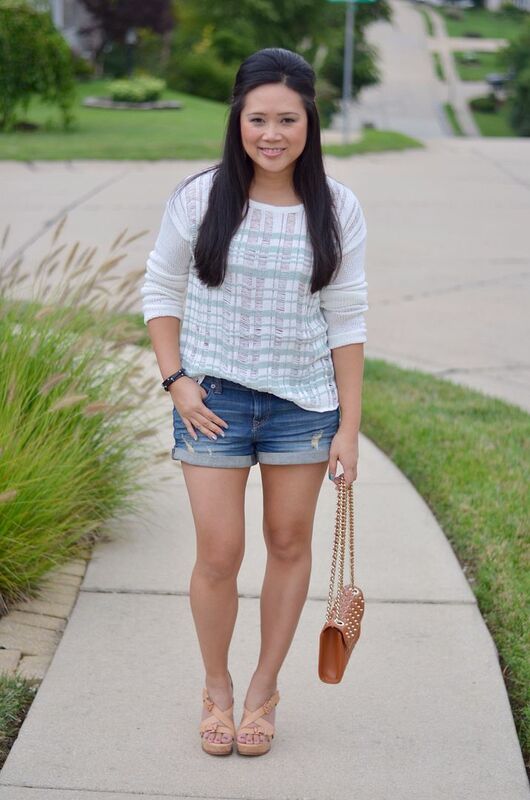 I love the subtle pattern of this cute sweater - it looks great with these distressed shorts. I loved the subtle pattern also - can't wait to style it again! Yay, that is so exciting! I can't wait to hear about it. This sweater looks so comfortable yet still chic. It is great with your shorts! Well I can't wait to share every second with you guys - thank you! Cute sweater! I added your cute outfit to my Fashion Friday Link Up for today! Head on over to my blog and check it out! Very exciting news, love the sweater by the way. Congratulations girl, and that sweater is so pretty I don't blame you for getting it, even in the summer. It's perfect for the summer, and I can't wait to style it for cooler months, too! 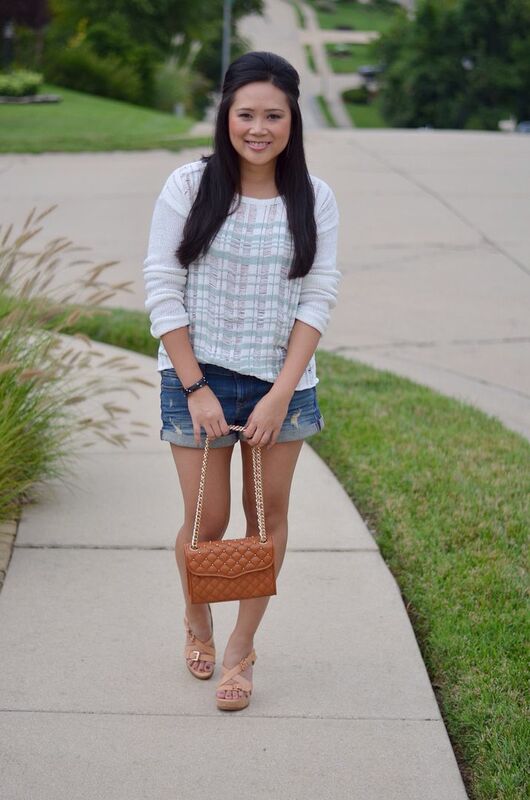 Loose knit sweaters are perfect for breezy summer nights and great to layer in the fall! You look darling in yours! For some reason I always buy summer sweaters and never wear them! Yours is so pretty and looks perfect for summer! That is funny! I never even think to buy sweaters in the summer, but I saw this on clearance and thought it would be perfect to even wear now! Congrats on the STL fashion week honor! So cool. I too love summer sweaters (even though it's sweltering here now), but there's something about back to school and the upcoming season that makes me shy away from brights and don more muted, neutral tones. Great look! Yep, there's definitely a fall feeling in the air despite the fact that the heat has not left! Awesome News!!! CONGRATS!!! I've been rockin' summer sweaters too and loving it!!! Have a great weekend!! Thanks so much! I'm really excited!! Thanks, girl! I'm glad you like it! Congratulations!!! This a fantastic opportunity! I am loving your sweater! So perfect with those denim shorts. I definitely think it's a great opportunity - so excited to be a part of it! Congrats woman! Can't wait for you to share your finds with us! That sounds like a pretty huge deal!!! I have never been before, but I hear fashion week is definitely a big thing here. I really cannot wait!! Congrats lady! I am on fall break during Fashion Week this year! The hubs and I might take a mini vacation then! I am hoping to get to a few shoes! Oh that sounds fun!! (Both the vacay and the new shoes!!) If it happens to work out- would love to bump into you!! Congrats, such a great honor for such a great lady! You are too sweet - thank you!